Th St. Mary's was the schoolship of the New York Nautical School (now SUNY Maritime College) from 1874-1908. 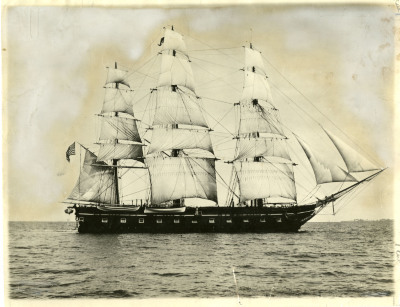 It was originally designed by Charles B. Brodie as a sloop of war. This photograph is part of the SUNY Maritime College Photographs collection, which was first organized by archivist Carol B. Finerman in 1974. According to Finerman, the photographs "accumulated over the years through the generosity of alumni and friends of the college." The collection was organized by subject, and the provenance of most of the photographs is unclear. As an unpublished work with unknown or corporate author, it enters the public domain 120 years from the date of creation.